The cup has a base decorated with arabesques and three raised bosses, one of which opens to reveal a small compass (the needle is missing, and the present compass plate is a nineteenth century replacement). The outside of the cup is decorated with arabesques and foliage, and the dial is engraved on the inner part. The gnomon is in the centre of the cup. The dial marks Italian hours, whose lines, numbered from 9 to 24, are to be read with the cup empty, as indicated by the inscription 'Horarium sine aqua'. The other lines, indicated 'Horarium ex perspectiua radiorum [star] [star] [star] [star] refractorum aquae [star] [star] [star]' are for common hours numbered from 4 to 12 to 8 and VI to XII to VI, and are designed to take into account the refraction due to water. The declination of the sun is indicated by the symbols of the zodiacal signs and the signature reads 'MARCVS PVRMAN MONACHI FACIEBAT [star] [star] ELEVATIO POLI 48 GRAD ANNO 15 99'. Where the brass plate is folded to form the cup, there is an unequal scale of latitudes from [0?] to 66? by 2?, numbered by 10?, with the indication 'SCALA ALTITVDINIS SOLIS'. 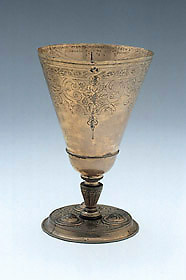 The external part of the chalice is finely engraved with flowers enclosed in cartouches, and a decoration on the rim.